Conophytum reconditum is widespread, very common and not in danger of extinction. Southern Kamiesberg and northern Knersvlakte. Shallow grit pans on gneiss, often beneath small rocks and wedged in rock cracks. There are no significant threats to this species. Conophytum reconditum is extremely abundant. There are many large subpopulations. It occurs in mat-forming colonies of several hundreds to thousands of plants. The population is not declining. Mitchell, A.R. 1984. Conophytum reconditum: a newcomer from Namaqualand. British Cactus and Succulent Journal 2(2):45-46. Wagner, G.F. 2002. 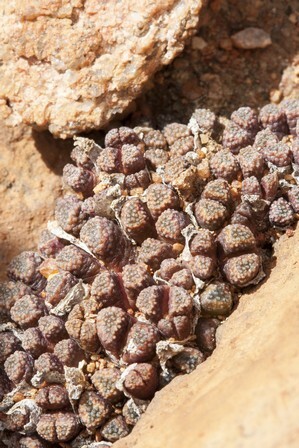 A new population of Conophytum reconditum A.R. Mitchell. Mesemb Study Group Bulletin 17(1):16. Young, A.J., Rodgerson, C. and Hammer, S.A. 2011. The rough and the smooth: a reassessment of Conophytum reconditum. Bradleya 29:93-102.